The Guardians of the Galaxy #23 at 13. Written by Ian Flynn, art by Dan Schoening and Patrick Spaz Spaziante. crossie’s note: Until next time, let the ponies hit the floor! I wouldn't consider Squirrel Girl "furry" simply because she has a tail, though that's just an OPINION. The art though... for somebody who is slowly mastering the brush, that is a high goal to aim for. I thing my usual comment is "vaguely furry" or "semi-furry" (and not because of the tail, but because of the ability to speak to squirrels which renders the squirrels furry supporting characters). Perhaps a more cynical way to put it is "furrier than most of the movies to win the Ursa Major this decade." 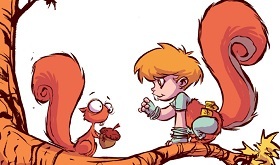 Also, that's Skottie Young; he's amazing. Just do a Google search. Wait, I already know him! We got a suggestion for Autumlands, apparently out monthly. Yes, very furry; I actually didn't see it this month. Either they're taking May off, or I just missed it, even though I actually looked for it, and since it's an Image book, and Image is the only freaking company that uses alphabetical order, I should have found it. Which version of Ratatoskr do you prefer?